Naming molecules is a challenging exercise because there are many rules; the more complex the molecule, the more rules that need to be observed. It is possible to name a single molecule in many different ways, but only one is correct! These are easy points on quizzes and exams and can boost your grade if you know how to tackle them. We here at StudyOrgo have summarized the process down to 4 easy steps to name alkanes. Follow along to determine the name of any molecule in your course. Identify the parent chain: Choose the longest chain. Looking at the first example below, several chain lengths are shown, however only the red trace contains the longest chain, therefore this is the correct parent chain. For two chains of equal length, the parent chain should be the chain with the greater number of substituents. 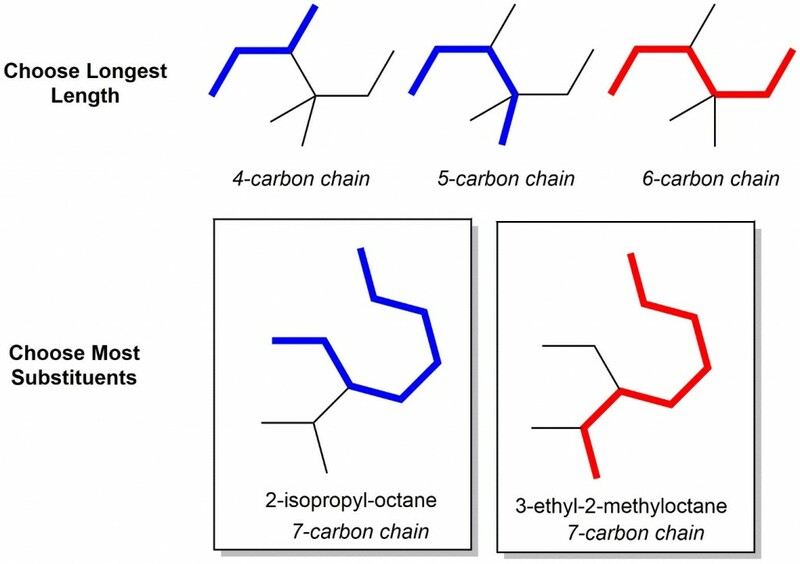 In the second example below, two 7-carbon chains are possible, but only one gives 2 substituents, so it is therefore the correct parent chain! Name the parent chain: In order to correctly name the parent chain, you will have to commit to memorizing the prefixes that denote how many carbons are in the parent chain. There is no easy way around it, so try covering the table up and recalling to help with memorization. Number the parent chain, identify and assign a location (carbon number) to each substituent: Just as with the parent chain prefixes, substituent prefixes are another terminology you will have t memorize! Give the first substituent the lower possible number. If there is a tie, choose the chain in which the second substituent has the lower number. 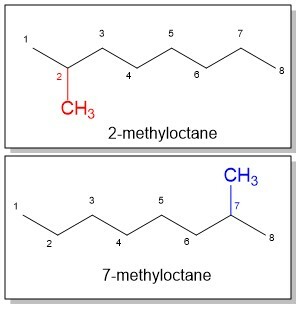 In the example of methyloctane, the methyl position could be at position 2 or 7. The lowest number prevails so 2-methyloctane is correct. Arrange the substituents alphabetically: Place the number corresponding to the position in front of each substituent. 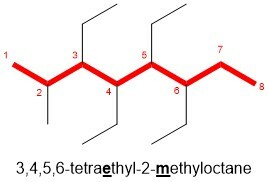 Note for the example below, there are four identical ethyl substituents, therefore we will label each position followed with the prefix tetra (di- for 2, tri- for 3, etc.) Note, the prefix is NOT included in alphabetization, as methyl comes after ethyl regardless of the “tetra” prefix in this example. And there you have it. With a little practice and help from StudyOrgo, you are well on your way to naming any organic molecule in your studies. Sign up today for help with terminology, reaction mechanisms and more!